Please refer to our stock # 2075 when inquiring. 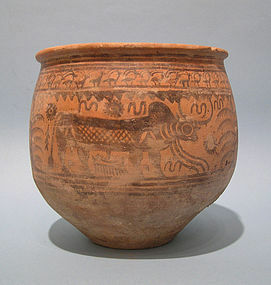 Monumental and rare Indus Valley Civilization Painted Pottery Bowl, 3rd Millennium BCE. Hand painted with motif of stylized water buffalo under tree and a frieze of multiple Ibex surrounding rim. Old private collection number beginning with 200 visible on body. Some earthen encrustation, small chip to rim and one stabilized rift but otherwise in very good condition. 8 1/4" high x 8 1/4" diameter. Ex: Barakat Gallery, CA. The earliest traces of civilization in the Indian subcontinent are to be found in places along, or close, to the Indus river. Excavations first conducted in 1921-22, in the ancient cities of Harappa and Mohenjodaro, both now in Pakistan, pointed to a highly complex civilization that first developed some 4,500-5,000 years ago, and subsequent archaeological and historical research has now furnished us with a more detailed picture of the Indus Valley Civilization and its inhabitants. The Indus Valley people were most likely Dravidians, who may have been pushed down into south India when the Aryans, with their more advanced military technology, commenced their migrations to India around 2,000 BCE. Though the Indus Valley script remains undeciphered down to the present day, the numerous seals discovered during the excavations, as well as statuary and pottery, not to mention the ruins of numerous Indus Valley cities, have enabled scholars to construct a reasonably plausible account of the Indus Valley Civilization.